Roxette is already underway with recording a new album. At the same time the band’s successful World Tour that began earlier this year will extend – and continue throughout most of 2012. 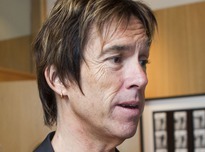 – We’ve already started recording new songs for our next album which will be a continuation on “Tourism”, says Per Gessle. 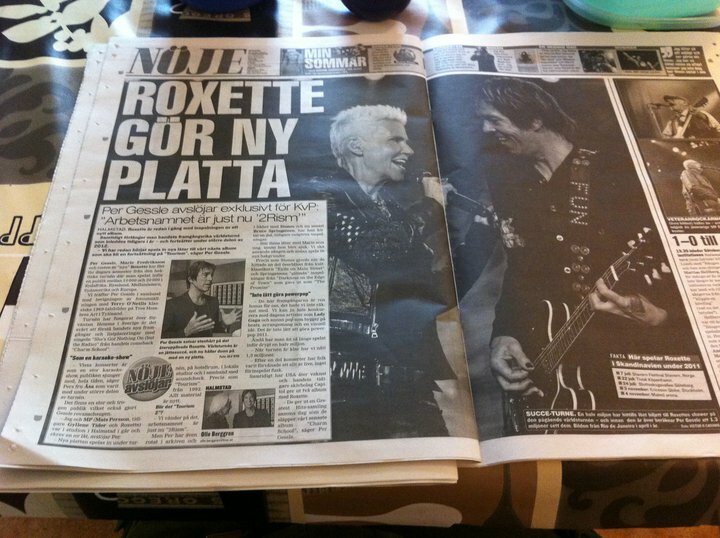 Per Gessle, Marie Fredriksson and the rest of the “new” Roxette has received a nine-day vacation from the hectic tour. Expressen met Per Gessle related with the opening of photography exhibition with Terry O’Neill’s classic 1960s images of Tres Hombres Art in Tylösand. – Some concerts are like a big karaoke-show, the audience sings along, all the time, says Per’s wife Åsa has been for most of the tour. Per found a part of previously unreleased recordings. – Here are the songs with young Marie, before she became ill. We will use the song and record new backgrounds. Like Stones did when they found some leftover from the cult classic “Exile on Main Street” and Springsteen’s “forgotten” recordings of “Darkness on the Edge of Town” that was released as “The Promise”. – These successes are pure bonus for us, that we had not counted on. We cannot compete with today’s artists like Lady Gaga and other pop based on beats, arrangements and a visual idea. It is not easy to do powerpop 2011. Yet we have just played for almost half a million people. When the tour is complete, we will reach 1.3 million. Thanks to Emilio Gimenez Bahl for the picture. Great to get the rumours confirmed! What irritates me is the bit about the re-discovered Marie recordings. Why use old vocals when she’s well and alive… But maybe the material is quite old and goes into ranges she can’t pull anymore? And then it says all new material. I guess it means all unreleased material, no live recordings of known songs (like TL, IMHBL, J on Tourism) to be included. Yes, that’s the only thing that worries me – that there will be old vocals from Marie. Okay, I know she cannot reach 3 octaves as before, but who cares? I don’t think these 1,300,000 people who attended/will attend Roxette concerts will be unsatisfied with Marie’s vocal possibilities nowdays. Can it be a demo album with old songs, but just new backgrounds? Or maybe quite popular nowdays to mix the background but leave the voices as they were – like The Beatles or Kate Bush latest albums. “I don’t this these 1,300,000 people” Hmm? I hope they will have uptempo songs by Marie (she still got what it takes! ), more real instrument (less computerize sound), more duets, powerful ballad like NMIOHW and IMOW (seemed they already in a good track), the album will have more than 12 songs (14 will be perfect), some decent videos (Maybe by Corbijn? or the guy who directed Queen of Rain) and a real professional photo-shoot for album cover. I meant to say “more uptempo songs” for Marie. Great news. 🙂 I can’t wait to hear the new (and old unreleased) songs. It’s great if the new album will have both old and contemporary vocals from Marie. I’d also love to hear duet from Marie and Helena – their voices are so different and I think Marie’s vocals would have suited perfectly many songs in the Party Crasher album. I think it’s great that there will be a new album!!! I guess they haven’t released the vocals of the “young Marie”, because Charm School had to prove that Marie can still sing. At this point in time, everybody would have said: “How cheap, they even have to take old material to make a new album!”. But by now, they have shown the world that they are back and still deliver excellent music, so they have the freedom for experiments. Why should they hide an excellent unreleased recording from Marie? Yes, I think you are so right, Jolentis! I actually wanted to state just the same. And perhaps the old Marie recordings are quite sensational…. I expect a great album for next summer, maybe. Great news! Can’t wait for it. I like the working title, I think it’s catchy, it should be the actual final title. Not sure about the old stuff – it sounds cool, I’d love to hear it, but maybe as a bonus disc or something like that. If they are to be included on the 2rism album, I think to fit in properly, they need to be completely re-recorded. But either way, I’m sure it’ll still sound awesome! I wouldn’t mind something like the accoustic warm up versions of DFS and so on that we see in the facebook videos included though ;-). Thanks Rox! 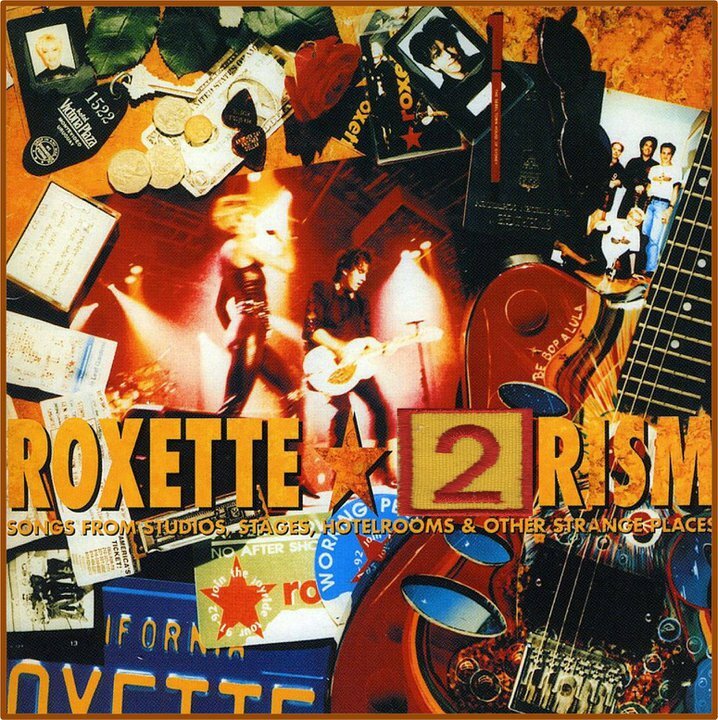 This certainly is very good news for a Roxette fan right now. I could care less if they use vocals from Marie from 1986/1995 or 2011! Her voice is stunning even with all the tiny changes. All that matter is that they are recording again and that they find the inspiration to do a project together as Roxette. I’m glad to hear MP is with Per in the studio. Now all they need is Anders Herrlin as well. 🙂 I also think that the 1.3 million Roxette fans (by 2012) will all agree that Marie still has what it takes to perform on stage & hey the band complement each other above expectation! I’m happy, thank you Per & Marie!